West Park, FL (February 28, 2012) – HandsOn Broward joined The Children’s Movement of Florida, Broward Family Life Magazine and the Children’s Services Council of Broward County for Broward Family Day on Saturday, Feb. 25. The project helped revitalize Broward County’s longest continually operating child care center, Carver Ranches, in West Park. President and CEO of the Children’s Services Council of Broward and chair of the Broward chapter of The Children’s Movement. “In partnership with The Children’s Movement, HandsOn Broward and Broward Family Life, we were able to make a meaningful and lasting impact on our community. The event was a great success and CSC staff members were proud to be a part of it,” she said. Throughout the day, 235 volunteers joined staff members from the sponsoring organizations in service activities to make over the campus. Volunteers painted the exteriors of three buildings; planted a butterfly garden and two vegetable gardens, painted murals, planted shrubs and revitalized the playground. 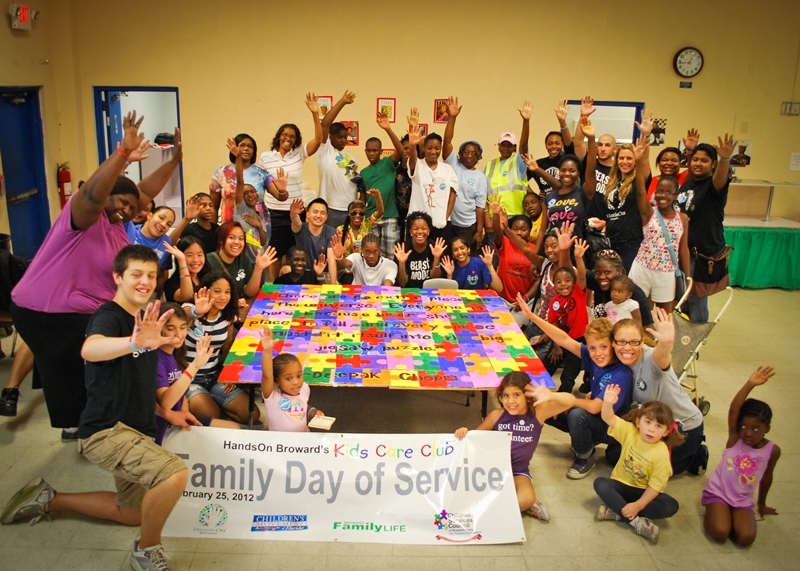 In addition to the makeover, HandsOn Broward hosted a special edition of its monthly Kids Care Club, during which 25 children participated in service activities that included making pillows, painting murals, and assembling peanut butter and jelly sandwiches to be donated to local food banks. Opportunities for Broward families to volunteer together are available year-round. 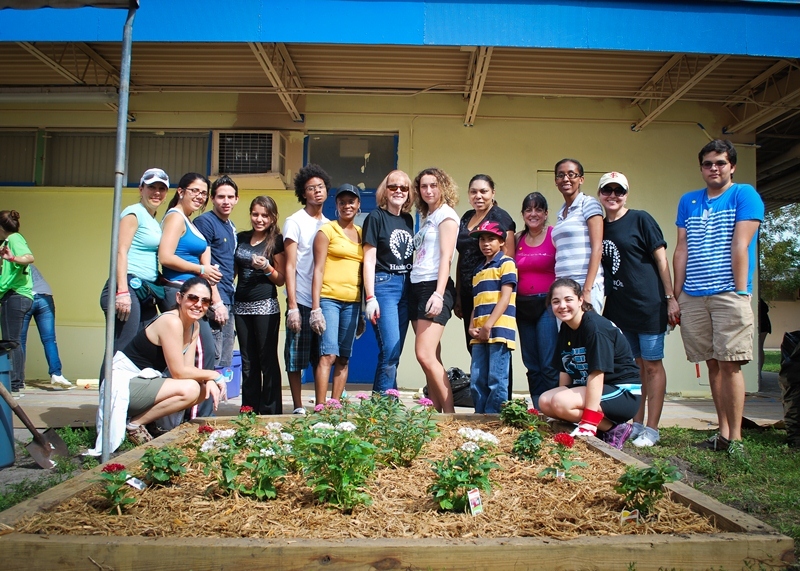 If you are interested in participating in a volunteer project in your neighborhood, contact HandsOn Broward at 954-233-1300 or visit www.handsonbroward.org. To see more photos from Broward Family Day, CLICK HERE. About Children’s Services Council: The Children’s Services Council of Broward is an independent taxing authority which was established by a public referendum on September 5, 2000, which, through Public Act, Chapter 2000-461 of the laws of Florida, authorized the Council to levy up to 0.5 mills of property taxes. The role of the Council is to provide the leadership, advocacy and resources necessary to enhance children’s lives and empower them to become responsible, productive adults through collaborative planning and funding of a continuum of quality care. About HandsOn Broward: HandsOn Broward inspires, equips and mobilizes people to take action to positively affect change in Broward County. 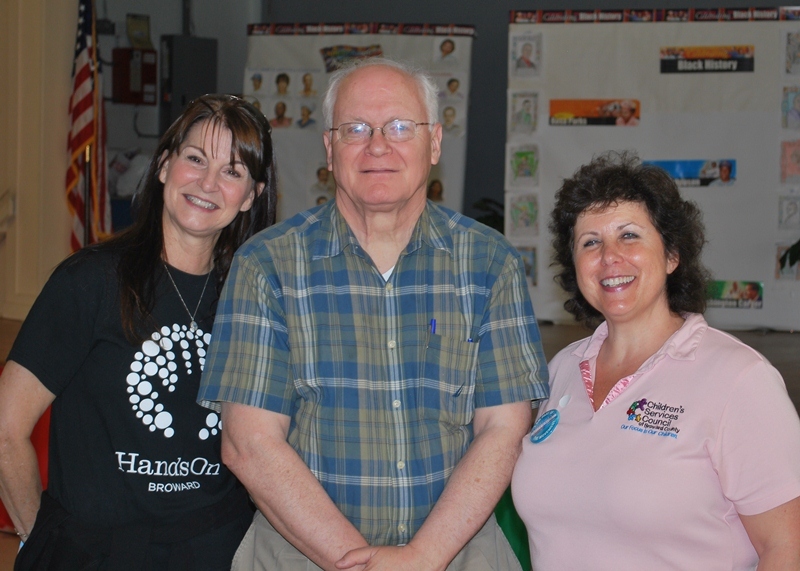 To learn more about HandsOn Broward’s upcoming service opportunities, or to schedule a volunteer orientation for your group, please call 954-233-1300 or visit us online at www.HandsOnBroward.org. About The Children’s Movement of Florida: The Children’s Movement of Florida believes that the well-being and education of our children in Florida must be the highest priority of government, business, non-profit institutions and families. The economic future of our state and the stability of the communities we live in depend on achieving this goal. The major objective of the citizen-led, non-partisan Children’s Movement of Florida is to inform the political, business and civic leaders, and the parents and people of this state, about this issue – and encourage them to make the well-being and education of our children our highest priority, including in the way we invest our public resources. 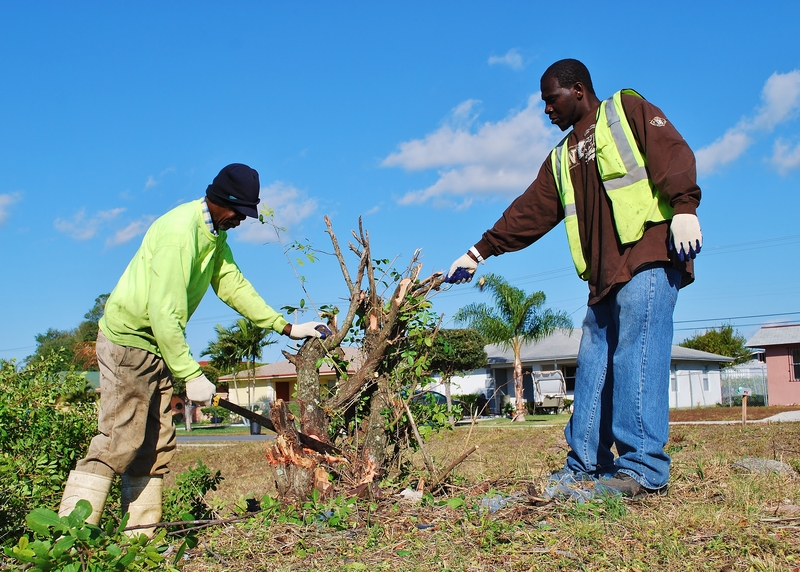 James Henry and Eddie Harrington volunteer their lawn services to help clean up a Collier City neighborhood. LAUDERHILL, FL – February 1, 2012 – Volunteer Florida CEO, Wendy Spencer, recently announced 13 organizations across Florida that are being awarded grants through Volunteer Florida’s BEST Neighborhoods initiative, including HandsOn Broward. The BEST program, which stands for Build-Engage-Sustain-Transform (BEST), is based on “neighboring”, a model concept of community engagement that uses volunteering as a tool to empower, mobilize and facilitate positive changes within communities. This past year’s BEST Neighborhoods program was a great success that exceeded our expectations, and I am thrilled to announce next year’s grantees,” said CEO Spencer. “Our BEST Neighborhoods program recognizes that every resident in a community has something to offer that can help a neighbor. By reaching out to marginalized populations, these BEST programs lift up citizens and communities through their volunteer engagement by rolling up their sleeves to meet local needs. It’s an excellent model of civic engagement and I look forward to working with our 2012 grantees”. Organizations who were awarded grant funds were selected based on their abilities to address one or more of the following areas in qualifying counties: economic recovery, education, disaster preparedness, environment and human needs. In total, 13 grants are being awarded covering 11 counties throughout Florida. HandsOn Broward plans to use the funds to develop resident leaders to affect positive change in Lauderhill and Pompano Beach neighborhoods. Hoping to pass her excitement for volunteering on to others, Mari Soliman has been a Project Leader with HandsOn Broward since 2006! Her favorite quote to sum up the importance of volunteering is that of Gandhi, “You must be the change you wish to see in the world”, and she attends each project with great dedication to these words of wisdom. She’s worked with many projects/groups such as our MLK Day of Service, Kids in Distress, Convalescent Homes, Kids Ecology Corps and the Jessica June Foundation. Being born and raised in NYC during the difficult times of the 1980’s, it was through hard work, focus on her education, making the right choices and the grace of God that she believes she was able to escape her negative situation. Because of this, she felt the need to give back. As she searched for an organization to help through, HandsOn Broward stood out because of the variety of areas in which for her to serve. She explains that “volunteering has allowed me to experience things that I may not have had the chance to. It allows me to appreciate what I have, appreciate the hard work of others, understand the perspective of others, and gives me a sense of fulfillment”. Her advice to new volunteers is to approach volunteering with an open mind and understand that all people involved receive benefits from the service. By donating your time/service, you’ll receive the satisfaction in knowing that you truly helped to make a difference. She also points out that some projects may not show results immediately and that one should not get discouraged over this and keep reminding ourselves that our actions mattered. Thanks, Mari, for your leadership and assistance in helping HandsOn Broward projects in being as successful as possible! Sami has such a strong grasp on the meaning behind volunteering that one may think she has been at it for years! She first heard about HandsOn Broward when she was in 7th grade at a National Junior Honor Society convention and waited patiently until her freshman year of high school to participate (she was too young before, but we have since started many exciting programs for younger children- understanding that people of all ages want to volunteer!). 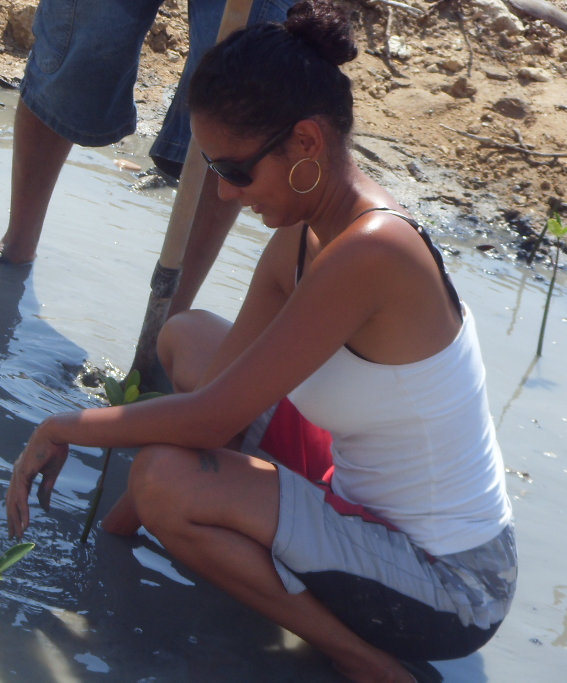 “Volunteering has changed my life. It brings happiness to me when I finish the job seeing smiling faces on the ones I’ve helped,” she says about her experiences. Since August, she has participated in multiple projects including our Kids Care Club (where she helped make over 150 sandwiches to be donated to the homeless), volunteering to assist teachers at her school and also helps out at the Hatikvah Hours (for Jewish adults with disabilities). Her advice to new volunteers is simple: “find a place to volunteer that you enjoy”. She stresses the importance of volunteering in something that feels good and doesn’t feel like a task. “Volunteering should come from the heart”. Thank you, Sami, for your amazing dedication to making a difference in our community! And for showing us that, when it comes to volunteering, age is NEVER a factor!